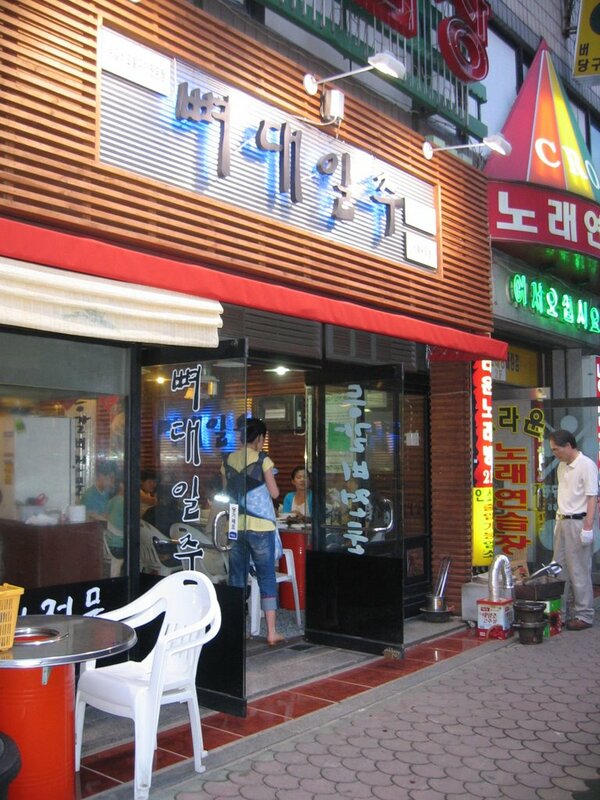 Rib Restaurant, Okpo. On the opposite side of the street from Beverly Hills 3 and walk towards the Four Fishes Supermarket. When you see the Ritchen store do not cross the street, it is two stores back from the corner. Spicy and mild ribs available. Quite good. Foreigner places in Okpo: Baskin Robbins, Quiznos, Dunkin' Donuts, Dominos Pizza. Underneath the London Pub there is a very good Korean beef restaurant. The marinated beef is great. There is a good pork restaurant commonly referred to as "The Trough." It is in the direction of the London Pub, but on a street running perpendicular to it and back from the water. The Delhi (Indian) is very good and can be quite busy so make a reservation. Mr. Pho (Vietnamese) is good, down near the water and soccer field.